1 John 5:1-5 Everyone who believes that Jesus is the Christ is born of God, and everyone who loves the father loves his child as well. This is how we know that we love the children of God: by loving God and carrying out his commands. In fact, this is love for God: to keep his commands. And his commands are not burdensome, for everyone born of God overcomes the world. This is the victory that has overcome the world, even our faith. Who is it that overcomes the world? Only the one who believes that Jesus is the Son of God. In my time of prayer and meditation, God began to paint in my heart the image of 2015. It all started in August 2014 and it has continued to date. He gave me the illustration/word, a little here and a little there. I will summarise the messages and impressions as follow, 2015 will be a year of the awesomeness of God, it will be a year of answers, it will be a year of the presence of God, it will be a year of supernatural harvest and maturity. He impressed in my heart that all this will culminate in TOTAL VICTORY. 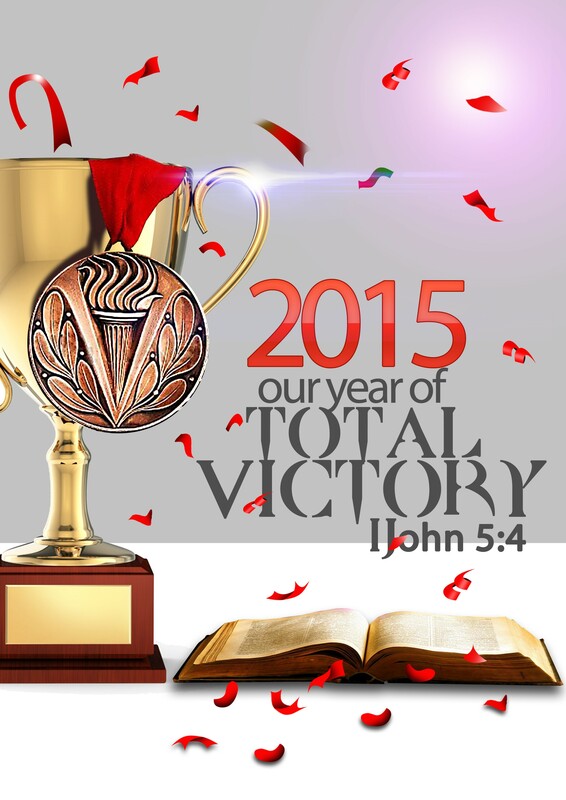 Therefore to encompass it all 2015 is our year of Total Victory. i declare as a man God that 2015 will be your year of Total Victory in Jesus mighty name. Nike (Greek) – Conquer, overcome, prevail. 1 deliverance, usually by God, through human agency, especially from oppression and in battle. From the above and in other words Total Victory is Complete, full and indivisible, divine deliverance, help, rescue, safety, prosperity, liberty, salvation freedom from trouble and conquest by God through human agency. This is what will happen to you in 2015 in Jesus mighty name. To have victory, you first have to face and fight battles. But the battles you will face are going to be a walk over because Jesus has already fought them and won them for you(John 16:33). These things I have spoken unto you, that in me ye might have peace. In the world ye shall have tribulation: but be of good cheer; I have overcome the world. (John 16:33. In the above scripture in 1john 5, we are told that because of our belief system, the fact that we believe that Jesus is the Christ(the anointed one and His anointing), because we believe that he is our burden remover and yoke destroyer we are birth into God’s royal family. And because of our new status we postioned as overcomers of this current world system. The word ‘world’ used in 1 john 5:4 is Kosmos in Greek meaning the manner in which things are arranged or system of operation. The bible says the things that are in the world operates on three basis, the lust of eyes, the lust of flesh and the pride of life(1john 2:16). So this is the tthree devices that the devil uses to penetrate an unsuspecting christian. Eyes, Flesh, Pride. The devil will try to use what you see , what you feel in your flesh and a deception that God’s word will not is not true and not work for you. He try to manipulate you to think that you better off doing it in your strength. But don’t believe him, he is liar and the father of it. He used the same method on Eve in the Garden of Eden. Adam and Eve fell for it(Genesis 3:1-7) but you will not fall for it in Jesus name because Jesus has won the victory for you but you have to stand your ground and resist the enemy and his temptations by claiming your victory and declaring it in Jesus name. Never lose sight of your identity as a child of God like Adam and Eve . Never settle for less because no one can offer better life than Jesus Christ. Start painting the picture of your total victory through the word. Imagine the victory that God has given you against all odds and see God turn your story and life around. In conclusion, walk in love towards God and man. Love is perfection of law. You can claim you love God and hate the people that God created in his image and likeness. The bible says I will have what I say, therefore I declare that 2015 is my year of Total Victory. In 2015, I will enjoy the awesomeness of God, it will be a year of answers for me, it will be a year of the presence of God, it will be a year of supernatural harvest for me and my family in Jesus mighty name. 2015 will be my year of Complete, full and indivisible, divine deliverance, help, rescue, safety, prosperity, liberty, salvation, freedom from trouble and conquest by God through human agency In Jesus mighty name. I will obey and keep the commandment of love in 2015. I am the blessed of the Love. What do see for yourself in 2015? Do you believe that they will come to pass?